Planting against a fence, house, stone wall, around a post, or even a drop off, may require tier planting with larger perennials planted in the back and rows of shorter shrubs in front. I’ve been thinking about this since I have many areas of my yard that will need sprucing up with colorful, flowering plants and greenery. So what can we use for our back row, which will have to be filled with the tallest plants? It’s a tricky question when beginning a garden because most plants will take a few years to reach the desired height. My favorite choices for the back row of a tiered garden are tall phlox, coneflowers, lilies and monarda (bee balm). Take into consideration the background – will they be planted against a white fence, or a wood one? Choose colors accordingly as white phlox will stand out against a darker color, but may not show up well if the fence is white. Also consider the amount of sun the garden will receive. If it gets very little to none, choose other flowers that will bloom in the shade. 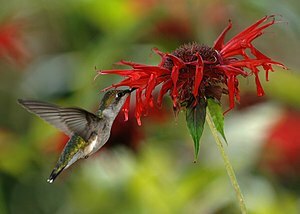 I want lots of color in my garden and I want it to attract wildlife such as hummingbirds and other birds that will eat the bugs. Good red choices are Monarda and coneflowers. Monarda will grow fast, and spread. Coneflowers will take longer, but can also get quite tall and their seeds are loved by chickadees and gold finches in Fall. Learn the colors of the different varieties and choose the ones you prefer and that will compliment your garden best.